Well, Mother's Day Out is still on break, so little K and I have had a few playdates with her bestest buddy, Cortland. These two might be the next Bonnie and Clyde. Um, apparently K knows how to work the childproofing locks at Cortland's house. This was in the bonus room at his house while his mommy and I sat on the sofa in the SAME room, but we got suspicious when we heard the glass bottles clinking. So, we had our next playdate in OUR bonus room. Because I KNOW K can't undo the child locks at our house. The sectional sofa is to the left, where Cort's mommy and I sat ONCE AGAIN in the same room as the kids thinking they were 'playing' behind the sofa. I never heard 2 kids giggle more than these two. I am still finding bits of shredded paper randomly, days after that 2 hour cleanup job. They are a hot mess, but sure are fun kiddos! that is HILARIOUS! it reminds me of a story of a friend of mine.... my daughter is friends with two other girls and we used to get together and play. one day the other two were playing at one mom's house when it was very quiet. i should also tell you that both girls had finally given up the paci. well, the mom found them hiding out in her daughter's closet with a paci one of them found and passing it back and forth and sharing.... like a joint! cracked me up! Oh My Goodness!! That is too much. All that paper!! Ha!! 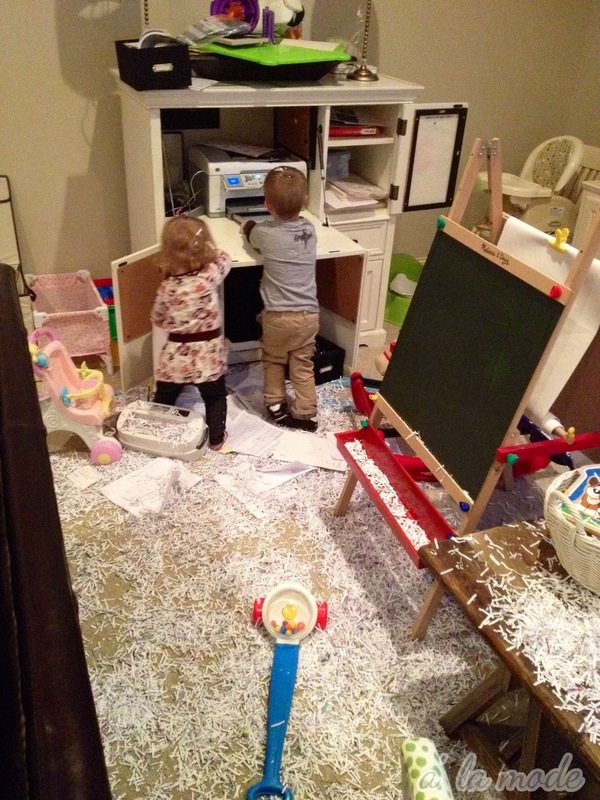 It is amazing what little messes they can make. I watch someone else's child 2 days a week at our house, so I have 2 little one year olds for 8 hours, they have fun lol. Ha! It is so nice to see others encounter the same "Mommy Fail" moments as I do! My 2 year old son is totally a Hot Mess! This is the best thing I have ever seen! LOVE!!! LOVE LOVE LOVE!!!! We are having a play date on my next trip to Nashville for sure! K and Wells will get along swimmingly! That is so funny! It always seems like our little Stella gets in the most trouble when both my husband and I are there. Guess we both think the other one is watching her! So much funnier when its not in your own house! And that first pic? Goodnight nurse girl... TOO MUCH! Thanks for the laugh! Oh my goodness...this is just what I needed tonight! A good laugh! How funny! What a delight they are, Shelli! 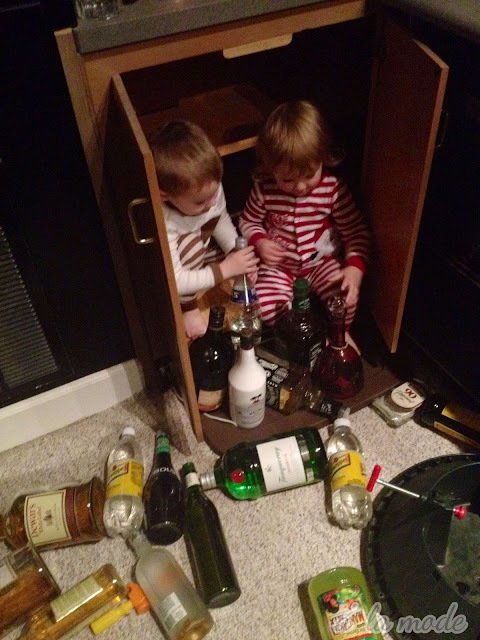 I have older kids and lock the liquor cabinet...you need to do that now! Genius Wall Holder For IPhone!!! Our Christmas Card 2011- MERRY CHRISTMAS! I'm Excited About The Everygirl! Holiday Home House Tour Link Up! Wanna Sneak Peek At My Holiday Decor??? The Holiday Card Dilemma- LOVE Me Some Minted! My Latest PD's Find For The Living Room Redo! My Mantlescape- Is That A Word?